(Bloomberg) -- The stockpile of corporate bonds with below-zero yields is on the rise. Blame financial repression, ‘Japanification,’ or the hangover from relentless monetary stimulus. Whatever your worldview, the frenetic global bond rally spurred by recession angst has pushed the market back to December 2017 levels -- when the European Central Bank was fast accumulating tens of billions of company debt, fueling a yield famine in its wake. At 230 billion euros ($259 billion), some 16 percent of obligations now guarantee losses if held to maturity, according to data compiled by Bloomberg. Even as 10-year bunds flirt with positive territory in Wednesday trading, the world of negative corporate debt won’t go away anytime soon -- robbing high-grade funds of a time-honored source of returns. “There is no alternative,” said Greg Venizelos, a strategist at AXA Investment Managers, which oversees over $800 billion overall. Investors buying a strong investment-grade credit may well get a better balance sheet than some euro-zone governments, he said. With traders effectively paying for the privilege to lend to issuers riddled with credit risk, it all bears echoes with the topsy turvy deflationary world of 2016. French firms LVMH Moet Hennessy Louis Vuitton SE and Sanofi SA sold short-dated notes yielding less than zero in recent months. It sounds nuts but with 10-year German debt trading at minus 8 basis points just last week, buying corporate notes with punitive carry can pay off in theory. Think about it like this: The asset class is like a zero-coupon bond which is acutely sensitive to shifts in interest rates. In other words, these obligations can outperform on a price basis when yields decline further -- as is the case for holders of the aforementioned Sanofi and LVMH notes which have sunk deeper into the negative zone since launch. 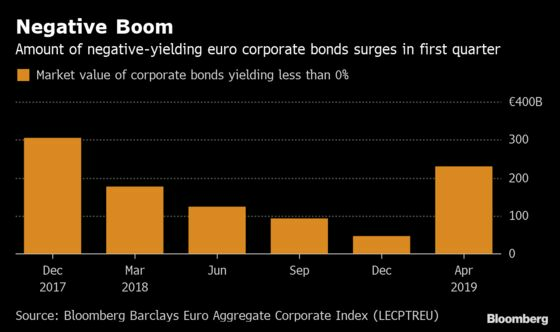 Around 140 billion euros of corporate notes are trading with yields of less than 0.1 percent but above zero -- ripe for turning negative in the next big rally. A huge pool of money managers are forced to buy corporate bonds at any price, of course. Passive products, for one, are designed to replicate benchmarks rather than to weed out assets like negative debt that effectively guarantee losses for buy-and-hold investors. As interest-rate traders bet on another lost decade in European growth, fund flows show a shift out of stocks and into fixed income, the safer asset. Europe’s largest credit exchange-traded fund by assets, for example, the iShares Core Euro Corporate Bond fund, drew a record 1.78 billion euros in first quarter of 2019, according to Bloomberg data. Meanwhile, two out of five government bonds in euros offer below-zero yields while portfolio managers are hit by negative carry on banks deposits, Europe might be facing prolonged Japanese-style stagnation.